Well-lit parking lots are essential to your customers’ and your employees’ safety. Studies show that nearly 80 percent of the criminal acts that occur at shopping centers, malls or business offices happen in the parking lot. In addition to being dangerous for your customers and employees, the lack of sufficient lighting in the parking lot could also result in a lawsuit if a crime did occur. In cases where companies are proactive and make the decision to install, repair, or increase their lighting system output, the amount of traffic to a business increases because patrons feel safer. And of course, more customers leads to more profit, which then offsets the expense of installing parking lot lights. If you need an expert Atlanta-area electrician to install parking lot lighting, call us. Or if you’re looking for an upgrade to your existing system, we can help with that too. We have years of experience installing parking lot light poles that are specifically designed for each specific lot. We understand that each parking lot is different, and each presents challenges regarding physical layout, terrain, location and security requirements. Our ultimate goal is to provide good visibility for customers and employees in order for them to feel safe and secure, and to present business owners with a cost-effective way to make that happen. We are also experienced in installing lighting systems in new parking lots. Our expert electricians make sure your parking lot light fixtures and pole lighting are wired and installed properly. You have our guarantee that your pole lights will operate at top performance. Your safety and security standards will never be compromised by faulty wiring or poorly-installed poles. We want your customers and employees to feel safe and secure using your parking facilities. 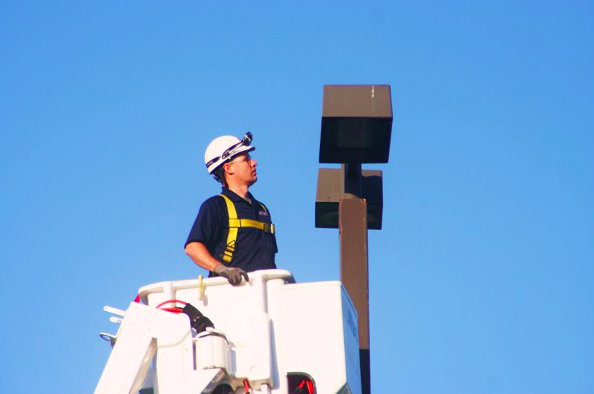 Our expert commercial electrical contractors in Atlanta will visit your parking lot and troubleshoot and repair the electrical problem with your pole lighting. We thoroughly check your parking lot lights, circuit wiring, and make any needed electric repair. Or, if you’re looking to install a system, we can give you a recommendation and an estimate of what we think will work best for your particular parking lot. Call us today!